The Plate Load Test (or Plate Bearing Test) is an insitu site investigation field test used to determine the ultimate bearing capacity of the ground and the likely settlement under a given load. It is designing for measuring static loads on spread footings (e.g. to determine whether the ground has sufficient bearing capacity to support structures or temporary works platforms for crane pads or piling rigs), and for repetitive plate loading tests of soils and flexible pavement sub grades. 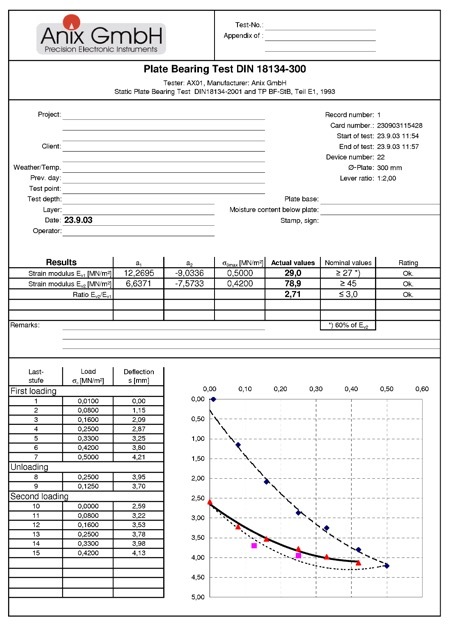 The AX01 Plate Load Test provides immediate repeatable results so that on-site decisions can be made straight away. Site characterisation is unarguably the most important, but also most “difficult”, component of geo-engineering. The AX01 Plate Load Test is designed to improve the quality of site characterisation and reduce the difficulties involved. An optional GPS-System allows the user to immediately determine and record the test position and this is integrated with Google Maps. The unit is designed according to DIN 18134: 2012-04 and is normally used to measure the short term settlement of road sub-grade or building footings under their proposed design load. The value of settlement against load is then used to check that the soil meets design load settlement criteria. The test therefore is of use to both contractors and to specifying authorities. 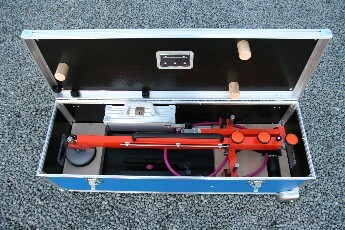 Applications for this non destructive plate bearing test method for measuring bearing capacity and compaction control include flexible pavements, unsealed roads and mine access roads, tunnels, railway track beds, airport runway and taxiways, hard standing areas, dam construction, canal building, wind farms, building foundations, pipe laying and tank farms. For example, the Plate Load Test is used to determine whether the ground has sufficient bearing capacity to support a given structure such as temporary pads for crane outriggers or piling rigs. It is very useful for mobile crane operators and piling rig contractors to check potential settlement of crane pads or mats under full load before the mobile crane or piling rig is sited or when traversing the site. The results of a Plate Load Test will enable you to calculate the size of outrigger spreader plates or mats required, and the ground movement that can be expected. We also have clients who require bearing capacity data but no penetration is allowed because of services e.g. on railway trackbeds. Clients include those involved in pavement construction, pavement rehabilitation, material testing, geotechnical testing and site investigation and include road authorities, councils, asset managers, mines, engineering and construction groups, mobile crane operators and piling rig contractors, geotechnical consultancies and research organisations. I would hate to go back to doing the Plate Load Test using the old method using dial gauges. It would be so time consuming, not to mention manually recording and then processing all the results. Insitu Test imports, sells and services, unique geotech equipment that has proved of great benefit to those who use it. It has a particularly beneficial role to play for those compacting soil in infrastructure projects.